EDITOR’S NOTE: The following is an excerpt from The Ultimate Prescription: What the Medical Profession Isn’t Telling You by James L. Marcum (Tyndale). It was 2:00 a.m. on Wednesday when my pager went off. Tuesday is a “call night” for me, which means I’m available all night for any and all situations that need my attention at the hospital. I should have known better than to think I’d enjoy a full night’s sleep. My colleague was right. The symptoms were common for myocardial infarctions. I knew the man in the emergency room was quickly running out of time and, if something wasn’t done soon, he could die. When I arrived in the exam room, “the patient” became David. He was now very real to me—a man with pale skin and terrified eyes. His blood pressure was dangerously low, he had already received a dose of aspirin to thin his blood, and he was hooked up to a beeping electrocardiogram (EKG) machine. I introduced myself and quickly scanned his chart. This was serious. Very serious. After breathing a quick prayer on my patient’s behalf, I began to explain to him that he needed a procedure to open up the artery supplying the front of his heart with blood and I was going to assemble a team to fly him by helicopter to a facility where this operation could take place. What happened next took only a few moments, but it seemed to last forever. David slumped down onto the examination table as his heart rhythm became completely random and unstable. The condition caused the blood to stop circulating in his body—a condition called ventricular tachycardia. Within seconds, he had passed out completely. A team of highly skilled caregivers rushed into the room. The skin on David’s chest was uncovered, and two electrode pads were attached to a device called a defibrillator by wires. These pads were placed over his heart. A shock of electricity jolted his body, causing it to convulse slightly as all eyes turned to the EKG. Sure enough, the waves of lines indicating the patient’s heartbeats ceased their wild and random dance and settled once again into a steady ba-beat, ba-beat, ba-beat. David’s eyes fluttered open, and he stared up at me for a moment, unsure of what was going on. “I’m okay,” he responded weakly, glancing about at the other faces in the room, wondering where all those people had come from. When I asked him about his pain, he said it was gone. I noticed that his blood pressure and heart rhythm had normalized, and for the moment, at least, my patient was out of danger. David had been dying and had been pulled back into life using a now-common technology. I whispered a prayer of thanks to the God who taught medical professionals how to perform “miracles” using the simple tools found in most modern hospitals. As preparations for David’s flight to the operating facility continued, I walked into the waiting room to talk with David’s wife and two daughters. They had heard the alarms. They’d seen the technicians running down the hallway. They knew that something was very wrong with their husband and daddy. And they were terrified. Panic showed in their eyes as they desperately clung to one another, trying to maintain a grip on sanity. How could this happen? I hear that question often. The answer isn’t easy, and I told David’s wife, Debbie, that I would explain everything as best I could later. But for now, we had to make sure that her husband was getting the acute care he needed. David’s left anterior descending coronary artery showed a 98 percent blockage. His heart simply was not receiving enough blood to function normally. The situation would be similar to having your air supply 98 percent blocked when you’re trying to climb a mountain. That would affect not only your ability to breathe but also the ability of every organ in your body—including your heart—to function. Blood—pumped by the heart—carries oxygen up to the top of your head and down to the tips of your toes. In essence, when your heart stops functioning correctly, your entire body begins to suffocate. Within minutes, a stent—a device to keep an artery open—was placed in David’s coronary artery so blood could flow freely again. My patient was fortunate that no permanent damage to his heart or other organs had taken place during his sudden heart attack and dangerous rhythm on the examination table. I guess the best place to have a cardiac event is in a hospital while carrying on a conversation with a cardiologist! This is where some well-meaning people miss an important point. We hear a lot about alternative medicines, potent herbal cures, or the importance of diet and exercise. And I will be the first to champion anything that has been proven to work. But there is, and always will be, a place for modern medicine, especially in emergency situations. If I have a heart attack, I want a stent. If my heart is going too slowly, give me a pacemaker. If I am bleeding to death, stop my bleeding and start a transfusion. If I have a bacterial infection, bring me some antibiotics. Without modern medicine, a whole lot of people would not be around to explore alternative medicines, examine herbal cures, or learn the importance of diet and exercise. David was suffering an acute event brought on by a chronic condition. As I later dug into his history, I began to understand why he ended up on my examination table. His heart disease was caused by elements in his life bringing stress on his body. He smoked. He held a high-pressure job. He ate food practically devoid of nutrition. But did he, his wife, or his two precious daughters recognize those stressors as the cause of his heart disease? No. Because they, like many of us, were operating under some serious misconceptions, and no one was making the lifestyle connection for them. As important as modern medicine and its technologies are, people fall victim to a number of misconceptions regarding what modern medicine can and can’t do. We’ll discuss these later in the book, but the first misconception is huge, so let’s take a look at that one before we go any further. What is a misconception anyway? Doesn’t it depend on a person’s point of view or perception? Not really. It’s a falsehood, a lie, a trick, or an untruth. These are all around us and have been almost since the beginning of time. Sometimes they are so elaborate that even the most astute people don’t recognize the untruth. But 99 percent truth is still a lie. Good and intelligent people are being deceived or have become clueless concerning many of the facts of life. Why? Amazingly, the reason usually comes down to money. More specifically, I want to suggest that the misconception exists because of selfishness. We—and the society in which we live—tend to put ourselves above the interests of others, often because of a desire for money, power, or control. One current misconception is the idea that modern medicine can fix anything. But to be brutally honest, modern medicine can’t fix a thing. What it can do is a pretty good job of dealing with the symptoms of a lot of things. It’s true that the doctor can set the leg. He or she can make it so you don’t have to limp for the rest of your life. But as for the healing of that broken bone, the doctor can only watch and be amazed. Absolutely! But many others who receive the same treatment, experience the same therapy, go through the same procedures die of their disease. Regardless of the survival rate, nothing was fixed. At best we’d have to say that a rampaging cancer was slowed—which is a good thing indeed. Life was extended through the application of modern medicine. Unfortunately, that extension often comes at a terrible price, including mutilation and collateral damage to other organs. And here’s the scary part: people who have heart disease, who suffer from cancer, who fight debilitating pain, who stand in lines at drugstores waiting to fill their endless prescriptions, who sit and watch television commercials extolling the power of the latest and greatest pharmaceutical firmly believe that their doctors or the pills are providing a cure to their ills. They think they’re getting “fixed.” But the truth is, they’re wrong. I divide illness into two categories: acute illness and chronic illness. Acute means that something needs to be done right now, this second, or a patient could die. That certainly describes David as his heart malfunctioned on the examination table. He needed action, and he needed it now. Chronic describes a condition of ongoing, frequent duration, one that is always present. Although David’s heart attack was sudden and acute, it was the result of something that had been going on for a very long time. Arteries do not fill up with plaque overnight. That is why, when his wife asked, “How could this happen?” I knew I needed more information about my patient before I could answer her fully. David’s heart attack wasn’t the problem. It was the result of the problem. Modern medical technology can be breathtaking in its effectiveness in treating acute illnesses. For instance, an article in the August 2011 issue of the medical journal Circulation reported that the average period from the time a patient arrives in the emergency room with a heart attack to the treatment to open the artery is down to sixty-four minutes. This is an amazing use of modern medicine to save lives every day. Most people are completely unaware of what goes on behind the closed doors of science laboratories and medical institutions. Our ability to learn and understand the universe and the human body is expanding faster than at any time in history. Force fields are no longer science fiction. Machines can now render objects invisible. Using atom smashers, scientists are hoping to discover more about the universe and the relationships between energy and matter. With enough energy, they are hoping to actually create matter. Teleportation of matter (the act of moving something simply by thought) is more than a theory at this point. Some discoveries are even being kept secret because of their military significance. There are now computers performing unbelievable computations. Our DNA has been sequenced, providing a glimpse not only into what is but also into what may be. I’ve been reading about something called nanotechnology, in which scientists are making very, very small particles capable of going into cells, diagnosing a problem, and delivering specialized medicines to address that problem. Yes, there is a place for technology. But this same body of knowledge is accomplishing something unexpected. Using these new devices and techniques, we are now discovering how activities such as worship can change chemical reactions in our bodies—reactions that affect every cell, muscle, and organ. We can identify how rest, nutrition, and even laughter help cure our ills and strengthen our immune systems. These “treatments” enable disease to be fought at the cellular level. This information has not been readily made available. And there’s a reason, which we’ll identify later. But there’s a downside to advancing technology. As it expands, we tend to look more and more at what we can do as human beings. We start worshiping at the altar of science instead of at the feet of the One who made us. As we start to see our symptoms diminish, we think we’ve found a cure. So who needs God? And the deception deepens. Cardiovascular disease is the number one killer in America, and its worldwide prevalence continues to rise. Some sources will contend that doctors, hospitals, medications, overdosages, and medical errors are surpassing cardiovascular disease as the number one source of death, and this may be true. But both statistics support the same conclusion. Neither patients nor doctors are clear about what exactly causes heart disease and how best to combat it. There are many theories regarding the causes. One common theory blames inflammation and damage to the inner layer of blood vessels, the endothelium. Another theory is that the real cause of the condition is genetic. But genetic alterations take many, many generations to develop. Heart disease was practically unheard of a hundred years ago, and there are still places on earth where very few suffer from this condition. For instance, in Africa, rural China, and other parts of the world where the diet is less Western (in other words, more plant based), the prevalence of cardiovascular disease is much lower. In about half the cases of cardiovascular disease, the first manifestation is a heart attack. In other words, patients don’t know the attacks are coming, and their doctors are not entirely clear about what triggers the attacks. That is why education is crucial. Over the next twenty-four hours, around three thousand American hearts will malfunction. This is nearly the same number of persons who died in the tragedy of September 11, 2001. This comes to 1.1 million heart attacks a year. One out of three people will die at the time of the initial event or within the first twelve months after it. Forty percent of Americans have cardiovascular disease of some sort, and in women the death rate from this condition is eight times higher than the death rate from cancer. In fact, in women, cardiovascular disease poses a greater risk than breast cancer and all other diseases combined. Those numbers continue to climb. I need to say something that may startle and even anger you. But I’m just the messenger, so please don’t shoot. It has been estimated that 80 to 90 percent of cardiovascular disease is acquired. That’s right. The painful truth is that we give the disease to ourselves by the choices we make over a lifetime. We create the chronic condition that brings about the acute event by placing endless stressors on our systems—stressors that eventually do us in. David did not even know he had a problem until that early Wednesday morning when he felt as if an elephant had sat down on his chest to rest. I thank God that after the event, David began his search for the ultimate prescription. When he was faced with death, he started to evaluate the reasons he had a heart attack. Copyright © 2010 by Dr. James L. Marcum. All rights reserved. Previously published as The Heart of Health by the author under ISBN 978-0-578-05968-6. 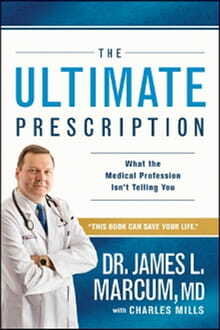 The Ultimate Prescription first published in 2011 by Tyndale House Publishers, Inc.
Visit Dr. Marcum’s website at www.heartwiseministries.org. James L. Marcum, board-certified cardiologist practicing with Chattanooga Heart Institute, has been named by USA Todayas one of the most influential physicians in his field. He is an in-demand speaker as director of Heartwise Ministries. Currently, his radio program, Heartwise, airs on more than 500 radio stations across the nation. Dr. Marcum, speaker/director of HeartWise Ministries, hosts the health programs "Heart of Health" and "BibleRX" which can be seen on secular and Christian television. He is married to Sonya and has two children, Kelli and Jake. He enjoys music and outdoor activities.